The parallel bars are a pun on the Barry name. 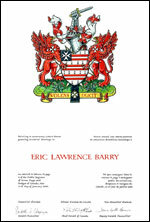 The ermine is used in the arms for Lawrence and thus honours Mr. Barry’s mother, née Lawrence. The Maltese cross denotes Mr. Barry’s involvement in the Order of St. John. The maple leaf and fleur-de-lis coronet refers to Mr. Barry’s Canadian and Quebec heritage. The mailed fist is taken from the badge of the Royal Canadian Armoured Corps Association, of which Mr. Barry is a life member. The dagger it holds is from a former badge of the Royal Canadian Hussars. The griffin joins the majesty of the lion, king of beasts, and the eagle, king of the air, underlining the strength and vigilance of both. The strawberries are another canting reference to the name Barry, and the Maltese crosses refer to the Order of St. John. This Latin phrase means "He leads willingly". 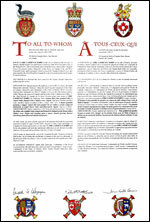 The announcement of the Letters Patent was made on July 22, 2000, in Volume 134, page 2265 of the Canada Gazette. 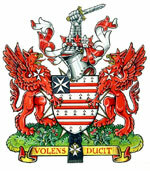 Original concept of Charles Maier, Athabaska Herald, assisted by the heralds of the Canadian Heraldic Authority.